In the past 6 months, I studied-like-a-madwoman-for and successfully passed my 3 hour long comprehensive exam, which determined whether or not I could graduate, applied for and got accepted to the Dietetic Internship program at New York-Presbyterian Hospital (which I will be starting in just under 3 weeks), graduated with my MS in Nutrition from Hunter, traveled to Belgium to present a research poster of mine at a nutrition conference, worked 6 days a week, and got engaged! It’s been a whirlwind to say the least. So it’s not that I haven’t found time to cook, I just haven’t found time to write about it. So two days ago I was chatting about wedding planning (which is a whole new level of insanity that I’m about to tackle while doing my full time 50 weeks of DI rotations – yes, excuses for not food-blogging in advance this time), and someone said to me: “There’s only one thing that every wedding must have: crab cakes.” And thanks to that, I’ve wanted crab cakes for the past 48 hours. I’ve never made crab cakes myself, so I decided to try it out tonight. I wanted to make it a little lighter than the usual deep-fried ones, so these are baked, and I threw together a combination of a couple of different recipes I saw, but mostly drawing from Ellie Krieger’s recipe. Whisk together 1 egg, 2 tsp dijon mustard, 1 tsp Worcestershire sauce, 1 tbs fresh lemon juice, 1/2 tsp Old Bay (or similar crab seasoning), and a little tabasco or other hot sauce. Add to that 1/2 cup of red bell pepper and 1 scallion, both finely chopped. Then fold in 1 lb fresh lump crab meat and 1/4 cup breadcrumbs, with a little salt & pepper added. Divide the mixture into about 8 servings, shape them into balls and then flatten slightly, and roll in Japanese panko (about 1/2 cup to coat all). Spritz with olive oil, or cooking spray, and bake for about 10 minutes on each side at 400 degrees. I’m vehemently opposed to tartar sauce, but feel free to serve these with the sauce of your choice! I just served ours with a squeeze of lemon, next to a salad of arugula, wheatberries, feta, dried cranberries, and pistachios, with orange zest vinaigrette. You could also make it into a sandwich. The cakes had some trouble staying together – possibly due to my inferior spatula skills – but made up for it by being delicious. Crabcake craving officially taken care of. 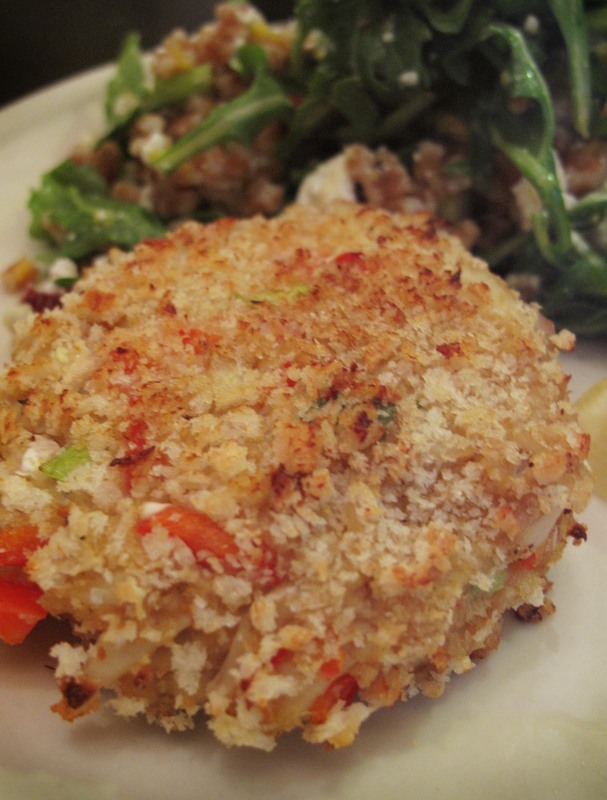 This entry was posted in Cooking adventures and tagged crab, dinner, seafood, shellfish. Bookmark the permalink.